Bell Helicopter gave an update this month on the Fly-By-Wire (FBW) system being developed for their new super-medium helicopter, the 525 Relentless, at the 8th Rotorcraft Symposium in Cologne. 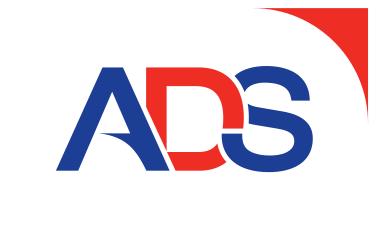 This event was organised by the European Aviation Safety Agency (EASA). The paper by Mike Bothwell and Awais Razais is downloadable as part of a large zip file for the whole symposium or directly here: 7.1._Bothwell_Bell Model 525 relentless advanced fly-by-wire – the pilot safety advantage. Bell claim that the system will aid pilot situational awareness and reduce accidents. Bell is keen to emphasise that the sidesticks are mechanically connected to eliminate two pilots inadvertently fighting each others control inputs. Though the lack of mechanical linkages elsewhere is touted as a safety advantage as it “results in fewer parts and fewer mechanical repairs”. A pilot can initiate a turn and even retrim the aircraft on the way into it and the helicopter will “maintain the attitude, heading, altitude and speed even if you are nowhere near the controls”. It will prove particularly beneficial in high-workload situations where task saturation becomes an issue, [Bell senior vice-president of commercial programmes Matt] Hasik says, adding that with the FBW system, “you can very easily put the aircraft into a very safe operating condition and put eyes out of the window with less worry than you might normally have”. Tactile cues, like those found on modern fixed-wing transport aircraft, have also been added to the controls, allowing the pilot to receive simple feedback about what the helicopter is doing. At low speeds for example the collective input results in the helicopter translating sideways. At higher speeds it results in a roll. 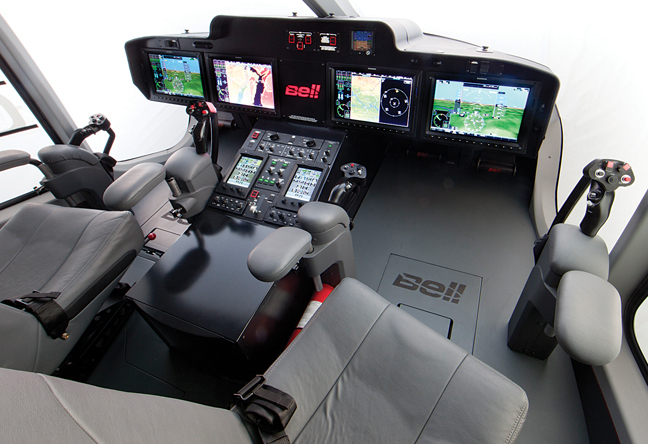 On 2012 Bell announced that they had selected Garmin to provide their newly launched new G5000H helicopter avionics suite. 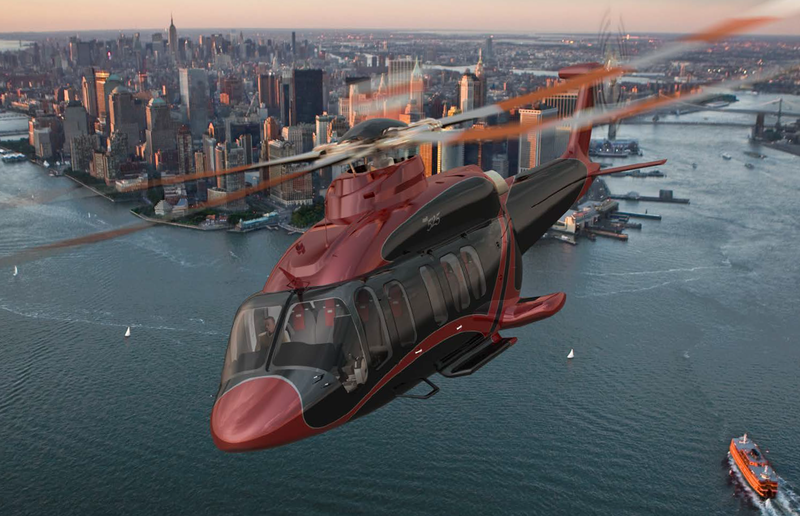 The Bell 525 will feature a four-display system and incorporate Bell’s new awareness, reactive and control (ARC) cockpit. Bell designed and built the flight control system, which runs on three BAE Systems flight control computers and Moog electrohydraulic actuators. In 2012 Bell also selected BAE Systems to provide the FBW computers. The development work will be conducted in Endicott, NY, with production at BAE Systems’ facility in Fort Wayne, Indiana. The collective and cyclic, made by Sagem, are mechanically interconnected (as are the anti-torque pedals) so they move in concert. Bell elected not to adopt electronically connected flight controls, due to the need for additional electronics to manage that connection and ensure reliability and redundancy. The reliability of the Bell 525′s FBW system is being tested in the Relentless Advanced Systems Integration Laboratory (RASIL). The RASIL includes a full cockpit much like a non-motion simulator, but hooked into all the lab equipment that replicates the 525’s systems. The RASIL hosts three separate 525 systems integration labs, one for the helicopter’s Garmin G5000H avionics, one for its FBW flight controls and a third for the electrical system. It was recently reported that electrical power on has occurred on the first aircraft. It was also stated in Cologne that the 525 Customer Advisory Panel was being briefed in early December on readiness progress for the first flight. First flight has slipped from Q4 2014 until at least Q1 2015. The Ottawa-based National Research Council Canada Institute for Aerospace Research (aka NRC Aerospace) has been researching helicopter FBW for a number of years on both Bell 205 and 412 testbeds. The Bell 525 is the first civil helicopter to commit to FBW. The first helicopter to enter service with FBW is the multinational European military NH90, alongside the military Bell/Boeing V-22 Osprey tiltrotor. The Sikorsky S-92F / CH-148 Cyclone for the Canadian Military also features FBW but has been substantially delayed for a number of reasons. Sikorsky has however introduced FBW into the H-60 and it will feature in the new CH-53K King Stallion. UPDATE 1 July 2016: The first flight took place at Amarillo, TX. UPDATE 18 December 2015: The second prototype has flown. UPDATE 27 April 2016: The third prototype joins the flight test programme. UPDATE 8 July 2016: The first prototype was lost in a fatal flight test accident on 6 July 2016, barely a year after the first flight. UPDATE 14 October 2016: EASA issue their Proposed Special Condition CRI C-04 on Interaction of Systems and Structure on helicopters configured with Fly-by-Wire (FBW) Flight Control System (FCS). UPDATE 6 March 2017: Bell Helicopter is preparing the next Relentless flight test helicopter (aircraft 003) for its first flight and resumption of the 525 flight test program. 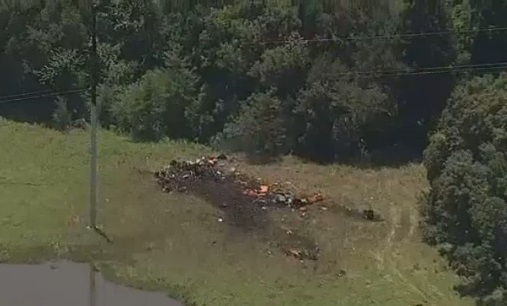 UPDATE 16 January 2018: The NTSB issue their report on the accident. UPDATE 1 March 2018: Bristow signed a Memorandum of Understanding (MoU) at Heli-Expo 2018 with the rebranded Bell to explore the 525’s possible use in the search and rescue (SAR) role. 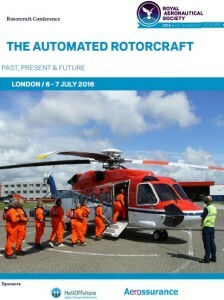 Aerossurance is pleased to be sponsoring the Royal Aeronautical Society (RAeS) 2016 Rotorcraft Conference, The Automated Rotorcraft, in London 6-7 July 2016.